These include deep brain stimulation (DBS), use of antipsychotics, anti-oxidants, anti-inflammatories and antibiotics. On the other hand, we are studying the effect of DBS in the lateral hypothalamus, for their involvement in energy homeostasis and the regulation of appetite, and the nucleus accumbens, for its involvement in the reward-system, in order to determine which DBS brain target is effective in the treatment of obesity and mitigate or prevent some of their complications. R Hadar, ML Soto-Montenegro, T Götz, F Wieske, R Sohr, M Desco, C Hamani, I Weiner, J Pascau, C Winter (2015).Using a maternal immune stimulation model of schizophrenia to study behavioral and neurobiological alterations over the developmental course. Schizophrenia Research Jun 5. pii: S0920-9964(15)00267-4. ML Soto-Montenegro, M Vicente-Rodríguez, C Pérez-García, E Gramage, M Desco, G Herradón (2015). Functional neuroimaging of amphetamine-induced striatal neurotoxicity in the pleiotrophin knockout mouse model. Neuroscience Letters Feb 19;591C:132-137. ML Soto-Montenegro, S. Peña-Zalbidea, JM Mateos-Pérez, M Oteo, E Romero, MA Morcillo, M Desco (2014). Meningiomas: a comparative study of 68Ga-DOTATOC, 68Ga-DOTANOC, and 68Ga-DOTATATE for molecular imaging in mice. PLOsOne Nov 4;9(11):e111624. ML Soto-Montenegro, J Pascau & M Desco (2014). 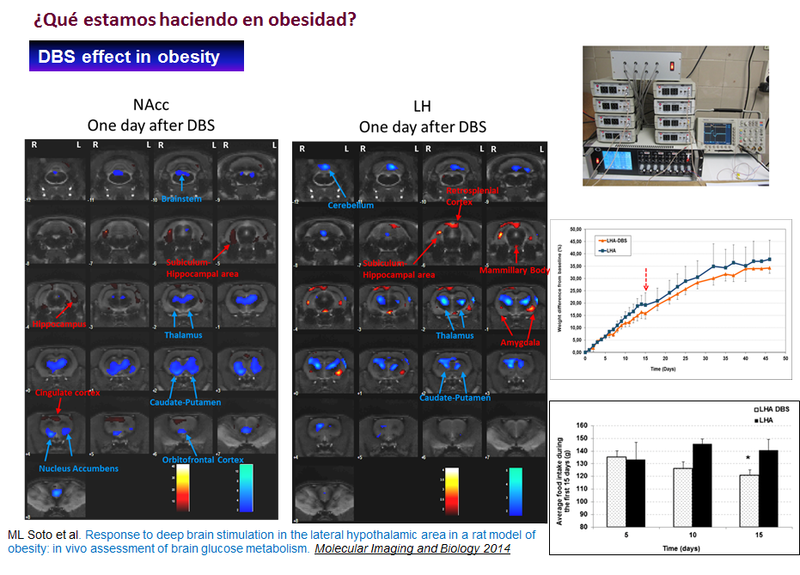 Response to Deep Brain Stimulation in the Lateral Hypothalamic Area in a Rat Model of Obesity: In Vivo Assessment of Brain Glucose Metabolism. Mol Imaging Biol. . Dec;16(6):830-7. L Urigüen, I Gil-Pisa, E Munarriz-Cuezva, E Berrocoso, J Pascau, ML Soto-Montenegro, et al. (21/6) (2013). Behavioral, neurochemical and morphological changes induced by the overexpression of munc18-1a in brain of mice: relevance to schizophrenia. 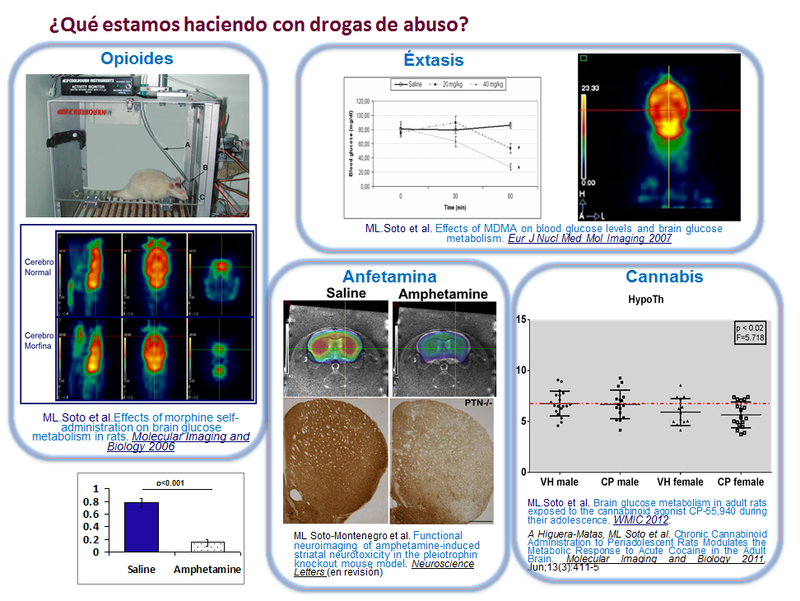 Translational Psychiatry 3, pp. e221 (10 pp) - e221 (10 pp). J Klein, ML Soto-Montenegro, J Pascau, L Günther, A Kupsch, M Desco, C Winter (2011). A novel approach to investigate neuronal network activity patterns affected by deep brain stimulation in rats. Journal of Psychiatric Research, Jul; 45(7):927-30. A Higuera-Matas, ML Soto-Montenegro, GL Montoya, V García-Vázquez, J Pascau, M Miguéns, N del Olmo, JJ Vaquero, C García-Lecumberri, M Desco, E Ambrosio (2011). Chronic Cannabinoid Administration to Periadolescent Rats Modulates the Metabolic Response to Acute Cocaine in the Adult Brain. Molecular Imaging and Biology, Jun; 13(3):411-5. Soto-Montenegro ML, Vaquero JJ, Pascau J, Gispert JD, Garcia-Barreno P, Desco M (2009). Detection of visual activation in the rat using 2-deoxy-2[18F]fluoro-D-glucoseand Statistical Parametric Mapping (SPM). Molecular Imaging and Biology Mar-Apr;11(2):94-9. Thanos PK, Michaelides M, Gispert JD, Pascau J, Soto-Montenegro ML, Desco M, Wang R, Wang GJ, Volkow ND (2008). Differences in response to food stimuli in a rat model of obesity: in-vivo assessment of brain glucose metabolism. Int J Obes (Lond). Jul;32(7):1171-9. M.L.Soto-Montenegro, J.J. Vaquero, C. Arango, I. García, P. García, M. Desco (2007). 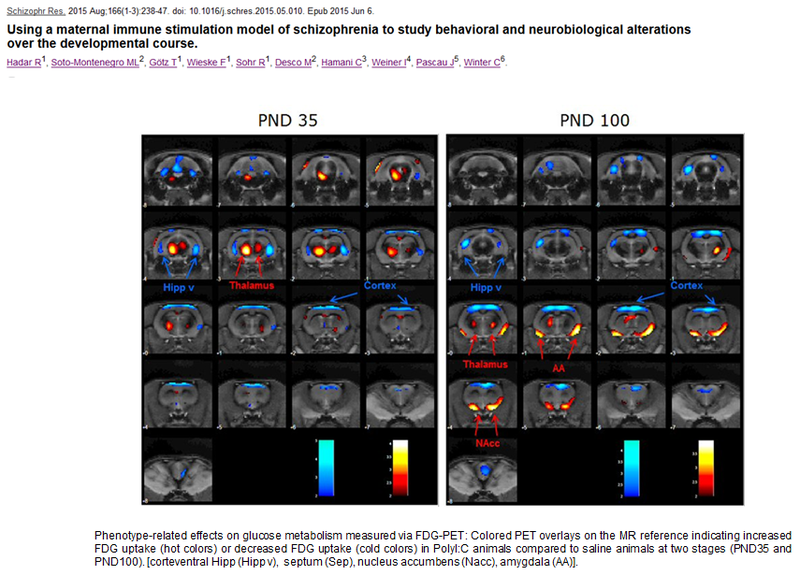 "FDG-PET study of the effects of MDMA on brain glucose metabolism in the rat". European Journal of Nuclear Medicine and Molecular Imaging, 34 (6): 916-25. Describing pathophysiology to promote focal therapy in treatment of schizophrenia – an animal experimental study. European Research Projects on Mental Disorders (ERA-NET-NEURON). 2011-2015. Prenatal immune challenge is an environmental risk factor for brain changes relevant to schizophrenia: Evidence from PET and MRI in a rat model for schizophrenia. Proy. intramural del CIBERSAM. 2013-2015. 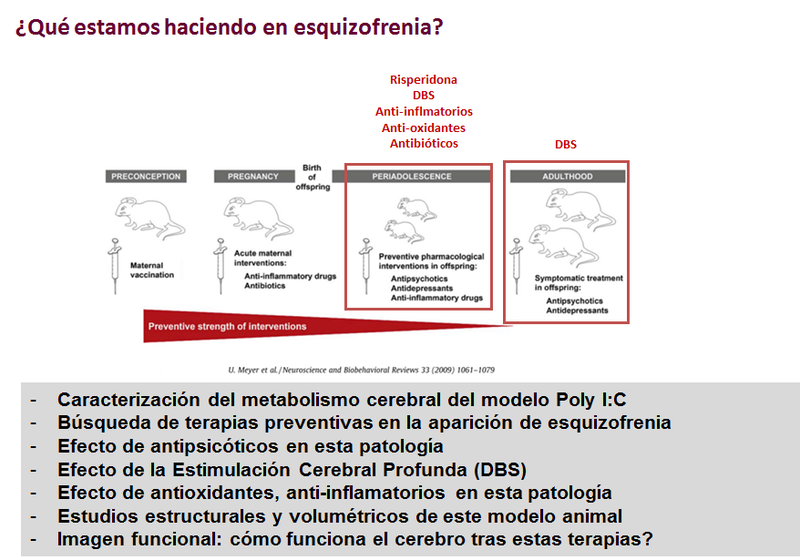 OBESIDAD: Tratamiento mediante estimulación cerebral profunda en un modelo experimental. Fundación Mapfre.